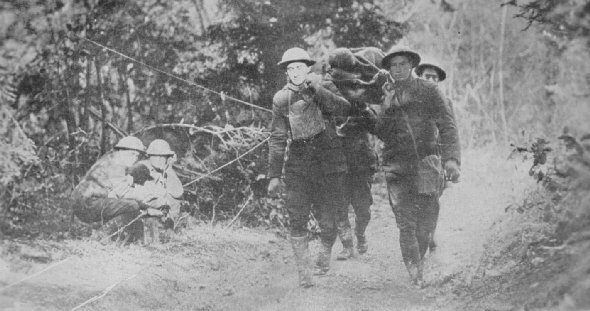 Wounded of the 312th Inf., 78th Div., being carried to first aid station in the forest of Negremont, near Grandpre, night of Oct. 21. The men at the left are operators of a field telephone set, actively engaged in sending messages. 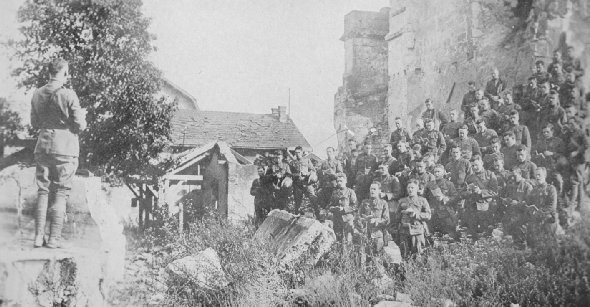 Men of 101st Field Signal Bn., 26th Div., attending outdoor church services in the ruins of a church destroyed by shell fire, near Verdun. Behind the lines for a short rest, men triedrather unsuccessfully, to get back to normal.